My family adores this fusion of Moroccan-Latin flavors. 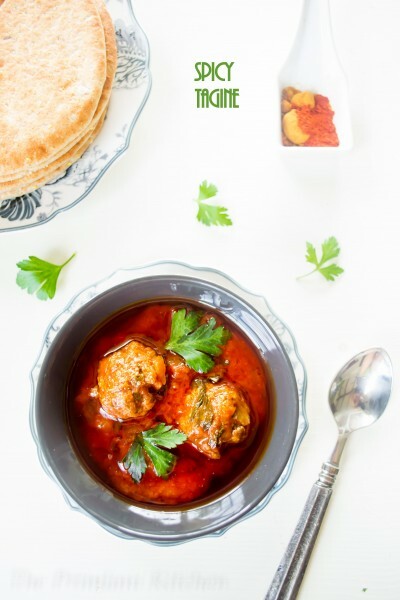 Beautifully seasoned spicy meatballs slowly simmered in a delicate melange of herbs and aromatic spices creating an intoxicating mix of flavors. Poach a few eggs in the divine sauce, and it is sublime! My kitchen smelled absolutely incredible while the sauce was simmering. Wish you could taste it!! I used Aji amarillo (for heat) and smoked paprika (for flavor) to spice this dish. Aji amarillo is the most common type of aji and is one of the most important ingredients in Peruvian cooking. It has a heat level of 7 on a scale of 10 (50,000 Scoville units). The unique flavor of the Aji Amarillo makes it worth seeking out and incorporating into your cooking. Even though it is a “chile pepper” it has a lot of fruitiness combined with its heat. It is a very versatile chile, suitable for everyday use as it will complement your dish without overwhelming it. Smoked paprika is a unique and versatile seasoning, one spice that captures the essential flavor of Spain. Different varieties of pimiento are slowly smoked over a low flame to produce a superb, intense flavor. It provides an inimitable especially in stews and rice dishes. Mix all the ingredients for the tomato sauce in a deep skillet over medium high heat. Bring to boil and simmer covered over low heat for 20 minutes. While the sauce is cooking, make the meatballs. Combine all the ingredients for the meatballs and gently shape into 1 inch balls. Wipe your hands with some oil to keep your hands from sticking. Once the sauce has simmered for 20 minutes, add the meatballs and 1/2 cup of water. Simmer covered on low heat for 45 minutes. At this point you can serve it immediately or add eggs in the sauce. If you add the eggs, cover and simmer the tagine for additional 5 minutes to poach the eggs. Serve hot with pita bread or choice of crusty roll to sop up the delicious sauce. Hot And yummy! Makes a great sauce for potatoes!